I write about cycles, seasons, and signs. And I write about them because that is my way to fully anchor myself into the present moment. Knowing the qualities of the signs and seasons helps me to align with the potential of the present. To find the clues, it isn’t necessary to memorize lots of abstract associations for each sign in an astrology book. I can look at nature too. And I do. Astrology’s signs are also seasons. A season is a unique portion of the year’s cycle. Each part, each phase of the whole year, mirrors for us the meaning of each sign. The opposite is also true. Each sign mirrors for us what the season is about. As above, so below. As without, so within. If we accept this, then we can look at the season for ways to best work with the potential of each sign, and we can also look at the sign to seek the best ways to work with the season. This way, the intersection of sign and season gives us access to the present moment and to the power of now. All this leads me to now—the season of Cancer. * Astrologers describe Cancer as a sign of gestation. Cancer provides the nurturing womb, the nest, the container for emerging life. This is vital to each of us regardless of gender or whether we are parents. Every person needs the power to generate life force. Every person needs to be able to nurture emerging life. I believe it is impossible to nurture anything without love. Cancer also teaches about love—how to love the tender, young part of our selves and of others. Every one of us needs this too. Cancer is the sign of summer in the northern hemisphere, but in the southern half of the world Cancer is winter. I wonder what the seasons of summer and winter teach us about gestation. I must admit, it bends my mind to try and integrate opposite seasons into one sign. After all, I best understand the signs and seasons from the place I live. However, I usually find a nugget of wisdom when I contemplate how opposite seasons are mirroring the same sign. This whole world thinking about signs and seasons helps me to integrate oppositions—a useful understanding of the Full Moon when the Sun and Moon stand in signs opposite each other. What do summer and winter teach us about gestation and nurturance? Summer nurtures through the feeling of abundance. At the peak of the growing season, the urge is to give abundantly. Cancer nurtures through unconditional love. During the time of finite resource in the middle of winter, we expect responsible behavior to ensure survival. Capricorn nurtures through high expectations. Two extremes of methodology with the same intention: to nurture life. As the Full Moon approaches (Cancer Sun/Capricorn Moon), begin to feel this continuum inside you. Where do you feel abundance and generosity? Where do you feel the serious obligation to ensure safety? I wonder if it is possible to open pathways between these two states? Regardless of where you live on the earth, can you invite in a mingling of obligation with abundance? How will this support your own gestation in this necessary season of Cancer? Sunday, July 6. Two tracks of energy are running throughout the week ahead: the tense track of cardinal signs vying with each other for who gets to be in charge and the flowing, sensitive track of water signs coming together for support. Yesterday’s Libra Moon (cardinal air) may have triggered more of the tense conflict, especially around justice and partnership issues. Today, the water signs offer healing balm if we are willing to step away from reactivity. What can you learn from water today? During this Cancer lunar cycle, we tune into how we need to tend to our tender and somewhat bruised selves. There is a strong awareness of the difference between the outside world of brash opinions and angry reactions and the inner world of nurturing emerging life. When the Moon moves into Scorpio this afternoon (CDT) this awareness strengthens. Monday, July 7. Women’s issues. Have you noticed how much we have heard about women in the news lately? Most likely, we will hear more today. Venus in Gemini makes two important aspects—a sextile to Uranus in Aries and a quincunx to Saturn in Scorpio. There is a push and pull to act. On one hand the desire is to support some kind of lasting transformation (the quincunx to Saturn) for women and on the other, to get anger or frustration off our chests (sextile to Uranus). Whatever side of issues we are on, the impulse is strong to find some way to right wrongs. Give space to feelings. The Sun in Cancer trines the Moon and this strengthens the grand water trine energy flowing through the week. How do flow and the desire to create safety support you? Step into your strength this evening as the Moon contacts Saturn. Don’t underestimate authentic passion. July 8—Gibbous Moon: Perfecting. Put on your paradox raincoats today. If you are interested in only clear-cut truth or black and white answers, this phase of the Moon may be challenging. Conflict is not a sign that things are going wrong, but it isn’t a sign they are going well either. The Cancer intention for the month is to create a home for the true self. This home is metaphorically and literally the place we gestate emerging life force. With the big emotional energies coming our way at the moment, we might have a hard time knowing what kind of environment will best support the creation and sustenance of such a home. Do we need to get mad and then get busy? Or do we need the quiet of contemplation and expanding empathy? If one thing is showing up strongly for you, can you open to the idea that there is something for you to learn from this too? The Sun in Cancer squares Uranus. There may be fireworks in the mix that is disturbing our sense of home and safety. Don’t back a bear, defending her den, into a corner. The claws come out. If that seems overwhelming, the grand water trine of Sun, Saturn, and Chiron offers solace through emotional wisdom. Wednesday, July 9. Truth is relative. How annoying is that? Wouldn’t it be great to know there was such a thing as absolute truth? Or would it? Notice the desire for fundamentalism. It seems to offer simple solutions that relieve stress. Unfortunately, this is only a temporary fix. The Sun trines Chiron today, part of the grand water trine, which also includes Saturn. Compassion is the opening to understanding someone else’s truth. Imagine that this is a super power that has more force than simplistic answers. Imagine you possess this super power and it lessens the violence in the world. Imagine this has something to do with creating a true home for the self. Thursday, July 10. Get moving today. There’s been a great emphasis this week on emotional experience and the contrast between fighting for what you want and going with the flow. Shake it up today by following the Sagittarius Moon into a new adventure. Set your sights on the far horizon and gallop towards it. Push your edges and get out of any funk you may find yourself in. Friday, July 11. With the Moon moving into Capricorn today, we feel the Full Moon energy rising. Capricorn is opposite to Cancer in the wheel of the year. An opposition creates tension until we find the balance point between. The tension involves hard choices surrounding the need for security versus the Cancer desire to make things softer, easier in this time of summer abundance. How best to create strong foundations? The Moon triggers the Pluto/Uranus square. Once again, we feel the stakes are high. The tendency to be reactive increases, and we take one more step into transformation. What step must you take today? 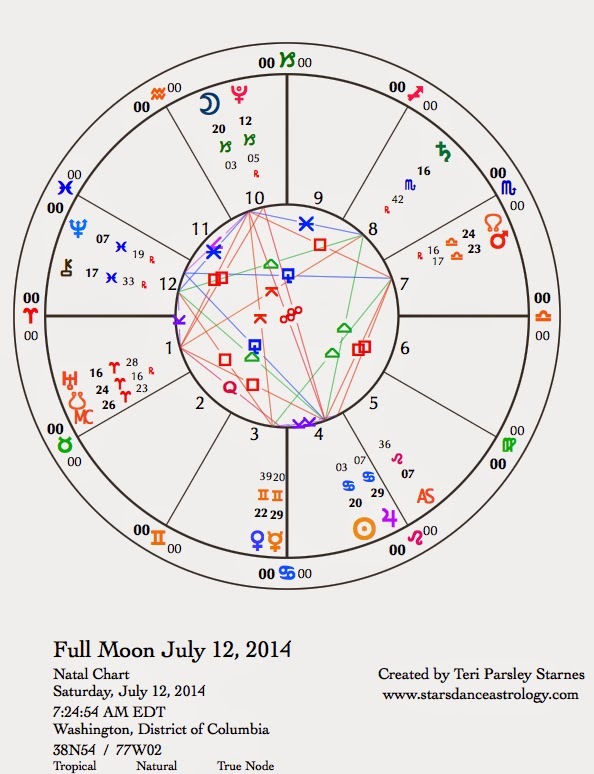 July 12—Full Moon: Illuminating. The transits of this week have been a journey leading to this moment. Will there be release and healing, will we find synthesis in the midst of conflict, or will we feel the stalemate of opposing forces that are determined to stay in the battle? The chart for the Full Moon shows all these possibilities. There is a grand cardinal cross and there is a grand water trine in the sky. Isn’t it grand? The grand cross has a tendency to create tension and sometimes stagnancy as forces stand their ground without giving an inch. The forces are the Sun in Cancer (with Jupiter nearby at the last degree of Cancer) insisting on the nurturance of life; the Moon in Capricorn, insisting, with Pluto nearby, on the firm defense of cultural structures that maintain traditions; Mars in Libra insisting on justice and fairness in relationships; and Uranus in Aries insisting on the freedom of individual expression. There is an all or nothing feeling to this configuration. It can feel like it is all about justice to one person and all about freedom to someone else; or all about accepting vulnerability to another and all about taking charge of the situation to someone else. Who will back down? Usually, no one. What we may need to do is expand what we think it is all about. It helps to get back to the Cancer lunar cycle intention. The prime directive of this season is to nurture emerging life through attention to our true home. All the other players secretly want this too, and as usual in conflict have a hard time seeing where they all can agree. The grand water trine, which is actually a kite formation with the addition of the Moon opposite the Sun, presents another choice. This trine is comprised of Sun in Cancer, Saturn in Scorpio, and Chiron in Pisces. Grand trines are supportive but can be hard to engage. The opposition of the Moon in Capricorn to the Sun creates the tension that can release the healing potential of this configuration. Water flows under the surface of stalemate offering to break up the pattern, letting the situation be infused with nourishing fluidity. How will you unlock this healing potential in your life? The wisdom of winter (Capricorn’s season in the northern hemisphere) is a clue. This particular Full Moon is what is known as a supermoon—a Full Moon (or New Moon) that happens when the Moon is closest to the earth. Visually, this Full Moon will look impressive, energetically it should be so too. The power of this phase is an opportunity to break up stagnant patterns and invite healing waters to flow. *The Cancer lunar cycle began on June 27 at the New Moon. Read more about the beginning of this lunar cycle on my Starsdance blog.